Up early for breakfast, but when we got there, the room was very busy, with large communal tables, and loads of old people in fake sailor themed clothes. It transpired that the ferry which docked across the road went to the island in half an hour, and that's why they were all there taking up space when we wanted to eat. The continental breakfast itself was quite meagre for such an austere hotel, worse than the NY hotel, and we left as quickly as we could to get away from the coffin-dodgers. Connor was still feeling a bit nasty, but we decided we couldn't really waste the day sitting around the hotel room, so we packed up the car and drove to Falmouth towards the ferry port at Woods Hole. The signs directed us to the Palmer Avenue parking lot as we got close to the terminal, and we followed the traffic directors to a space up near the back of the lot. We got on the little shuttle bus with its loud lady driver, and soon we were off on the 15 minute trip to the ferry port. 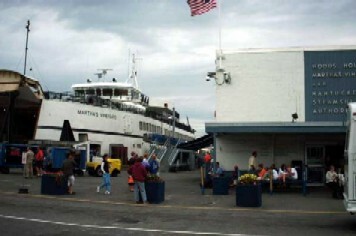 When we got there, a ferry was boarding about to leave, so we ran into the terminal and bought tickets, and dashed out. We'd been a bit too fast because we still had to wait in line for the ferry to finish loading motor vehicles before we were allowed on. We made our way to the top deck, and the morning was clear and bright as we took our seats on the top outdoor deck for the 20 minute trip across the water to the island. As we got closer, we took some photos of the approaching shore, and also the buoy floating in the bay near Oak Bluffs, which was where the first shark victim died in the movie Jaws, which was filmed in Martha's Vineyard in 1975. The ferry docked at Oak Bluffs and we made our way down the jetty for our first step on the island. The town itself was sleepy at this time of the morning, and we wandered around aimlessly a bit up and down the quaint little street. Eventually we realised that the public transport was minimal, so we went over to a car rental place on the main street and asked about renting a jeep for the day. The guy in the shop was very friendly and helpful, and it would only cost us about $100 to rent a jeep for the day, which was pretty cheap really. So we rented one, a nice red soft top jeep with the roof down, and the guy gave us two child-seats for free. So we were off, with wheels, to explore the island. We drove up to Vineyard Haven first of all, but it was almost a replica of Oak Bluffs, so we didn't stop. We'd been up so early and had such a meagre breakfast that we considered stopping at a restaurant for an early lunch, but we couldn't get parked anywhere. So we got lost in the back streets of Vineyard Haven for ages, before finding a road south out of the town. We'd previous arranged to go see some chickens that we'd seen on the famous Martha's Vineyard chicken cam, and I'd been given an address on South Street, so we tried to find the place, and spent the next hour or so driving up and down the roads looking for the correct turn off, to no avail. I was going to stop somewhere and phone the guy for more precise directions but Connor had begun to complain that he was feeling sick again, and was hiding under a jacket on the back seat. I'd forgotten to bring my glasses, so I was having some eye strain after reading all the road signs and mailboxes on the way up and down, and was beginning to get a headache. The roads we had been on were boring, not the coastal vistas I'd been expecting, and I was getting a bit grumpy and annoyed and hungry, and Connor was getting quite feverish in the back, so we decided to abandon the trip altogether. 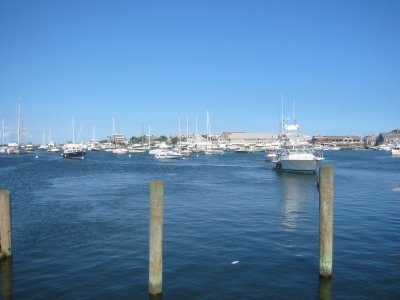 We made our way back to Oak Bluffs and returned the jeep. The guy was surprised to see us, and when we explained that we had a sick kid, he returned us $70 of our money, which was very nice of him. We got back on the ferry, a bit dejected and disappointed that our day there hadn't lived up to expectations. I had a hot dog on the ferry and felt a little better. Connor was still sick and we got back on the bus to the parking lot and drove back to the hotel and put him to bed. I took Niamh back down to the swimming pool and we splashed about for a while, while Karen stayed with Connor in the room for a couple of hours. When we came back to the room, Connor had woken up and was feeling a bit better. We were all starving, so we decided to play safe that night and go to the IHOP we'd seen on the outskirts of Hyannis. When we arrived the service was lousy, eventually we were shown to a seat, but nobody came to take our drink or food order for about 15 minutes, so we got up and left. We'd been used to excellent service in the IHOPs we'd been in other places, so this was a bit of a shock. Luckily, there was a Friendlys close by, and we had a lovely dinner in there, before coming back to the hotel for our last night in Hyannis.